Are you a person who constantly lives in the past? Do you constantly have fleeting or direct thoughts on how great it would be to go back in time and relive a moment and change it so it turns out differently? Perhaps the movie Back To The Future is your favorite and you wish you could find a Delorian and get yourself a flux capacitor to take you back to that moment that you regret in order for you to recreate it! That isn’t happening anytime soon…well anytime ever! It’s time to get over the past and live in the present. The present is called “the present” for one reason–it is a gift and you get to live this moment out and make it happen the way you want it to go! Too many people choose to live in the past even when the past was not so good, even awful! Why the heck would anyone want to allow their minds to grovel and wallow in the past? Well, even if it was bad, the past still provides most people with a sense of comfort. They’ve been there, done it, lived it and had emotions invested in it. Where people become hostages to the past is when they allow those same emotions and thoughts to be continually tied to that same moment in the past. In their minds they have allowed themselves to become fixated on that moment not only because it made them emotional, but that moment could hold some iconic significance for them which is drowning in “regret“. If the moment was bad, it created regret which is anchored in bitterness, anger and even hatred, and then they have a very hard time of letting go. They become shackled to a moment that can never be changed! Too many people embrace a feeling of bitterness which was based on something that happened in their past. They hold onto this bitterness as it is symbolic of what someone did to them or didn’t do for them. It is also symbolic of what they did or didn’t do for themselves. This “bitterness” is the key to hope – somehow or someway the past will magically correct itself or they will get a do over. Too many people hold onto the past because they enjoy feeling or playing the victim’s role. They believe something wrong happened to them unfairly and they believe in karma or that God will reward them for this mishap and the burden they continually carry around. The only way that karma or God will ever work in their lives is to apply the creed of what recovering addict’s cite, “Let go and let God!” It means letting go of what you know longer have control of – the past! You will only truly ever be able to live in the present and have a great future when you accept that the past is just that… the past. It can’t be changed ever. The only thing you can control and change is you and how you look at what you have now… this present moment in time! 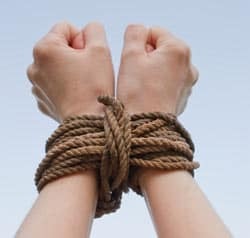 Not Being a Hostage to the Past is one of the fundamental topics I deal with in my Confidence and Self-Esteem Program.